Music Web International: Recording of the Month April 2013: "A superb recital"; Klassik Heute 10/10/10 March 2013; Klassik.com 5/4/5/4 Stars, February 2013. If claims could be made for a certain composer to have invented a genre single-handedly, Felix Mendelssohn would be a strong candidate with his ‘Songs without Words’. The term itself can be traced back to 1828, and a letter in which Fanny Mendelssohn mention having received a ‘song without words’ as a birthday present from her brother. Although Mendelssohn continued an existing tradition of writing short lyrical pieces for the piano, the concept of ‘wordless songs’ was new, and indeed the great majority of the Lieder ohne Worte display some sort of song-like structure (melody in the upper voice, an accom­paniment that is predominantly chordal or arpeggiated, ABA-form). 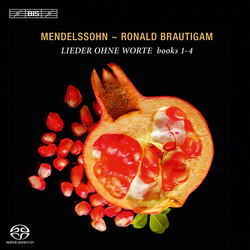 Gathered on this disc are the first four books of the eight published collections of Lieder ohne Worte (two of which appeared posthumously) and an appendix consisting of five individual pieces which Mendelssohn never included in any collection but which nevertheless belong to the genre. One of today’s leading exponents on the fortepiano, Ronald Brautigam has released complete sets of the piano music by Mozart and Haydn, and is currently recording a highly regarded series of the solo piano works by Beethoven. For the present disc he has chosen to play on a replica by the renowned maker Paul McNulty of a Pleyel instrument built in 1830, and thus contemporary with the music performed on it.